Brent Leach had already made history by the time he stepped on the mound at Tokyo Dome Thursday night. There’s not likely to be any celebrations for this particular mark, however. The Yokohama BayStars pitcher would probably rather just put it in the rearview mirror. The 28-year-old Leach is back in Japan after leaving the country in the wake of the March 11 earthquake and tsunami over concerns from family members. Many other foreign players returned home as well, but all mostly reported back to their respective clubs. Leach however, stayed behind in the U.S. This prompted the BayStars to place him on the restricted list, making him Japan’s first seigen senshu (restricted player). 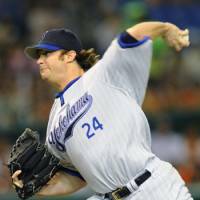 Yomiuri Giants pitcher Brian Bannister was placed on the list soon after. Bannister still has not come back to Japan. Leach, a 196-cm southpaw, was encouraged by the BayStars to return, which he eventually did. Now, he’s hoping to make amends both on and off the field. “I have to earn back the respect of not only my teammates and coaches, but of the fans and the front office,” said the Flowood, Mississippi native. Making his first start in Japan at the Big Egg, Leach attempted to take the first step toward shifting the focus to his actions on the mound, rather than what happened off it. 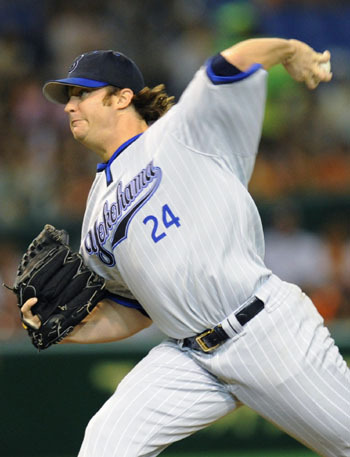 Leach, who pitched in 38 games for the Los Angeles Dodgers in 2009, said the team’s willingness to accept him made coming back to Japan much easier. Despite going on the restricted list, Leach believed he would get a chance to play baseball this season. To that end, he kept working throughout his time back home. Leach pitched well early on in his debut this week, but faded a bit down the stretch in the team’s 9-2 loss to the Giants. He allowed four runs on five hits over 4⅓ innings. He threw 83 pitches and held Yomiuri scoreless before a disastrous four-run fifth inning. Having not previously played in a game this season, Leach said he’s going to work on being able to maintain his strength deeper into his starts going forward. “It’s embarrassing seeing yourself going down and having to go to your junk early instead of pounding your fastball,” he said. Mostly the left-hander seems to want to put the last few months in the past, saying he was thankful to get the chance to come back and pitch in Japan. “Hopefully I can give you guys something better to write about next time,” Leach said after Thursday’s loss. Hunter Pence is adding his big bat to a pennant race. Philadelphia is counting on its latest All-Star acquisition from Houston to do what Brad Lidge and Roy Oswalt did before him — help take the team with the best record in baseball deep into the postseason. The Phillies made another deadline splash Friday night, acquiring Pence from the Astros for a package of highly rated prospects. “He’s a guy that I think our fans will take to very well,” Phillies general manager Ruben Amaro Jr. said. The NL East-leading Phillies got the right fielder and cash from Houston for three minor leaguers and a player to be named, shoring up their lineup as they try to make it back to the World Series for the third time in four years. Amaro is developing a knack for pulling off big deals right before baseball’s non-waiver trade deadline. He acquired ace left-hander Cliff Lee in 2009 and right-hander Oswalt last year. “Hopefully he comes in, fits in and helps us,” Lee said. Oswalt helped pitch the Phillies to the NL championship series last year. Before the 2008 season, the Phillies got Lidge from the Astros and he went 48 for 48 in save opportunities and led them to a World Series title. The 28-year-old Pence began the day with a .309 batting average, 11 homers and 62 RBIs. Houston nabbed two of Philadelphia’s top prospects in first baseman Jonathan Singleton and right-hander Jarred Cosart. But the Phillies managed to hold onto talented outfielder Domonic Brown. The 19-year-old Singleton was batting .282 with nine homers and 47 RBIs for Class-A Clearwater. He was selected by the Phillies in the eighth round of the 2009 draft. The 21-year-old Cosart was 9-8 with a 3.92 ERA in 20 games, 19 starts, for Clearwater. Rebuilding Houston also got 25-year-old righty Josh Zeid, who was 2-3 with two saves and a 5.65 ERA in 21 games, 11 starts, for Double-A Reading. Amaro said the Phillies were able to stay under the luxury tax. He also refused to say he was done dealing before Sunday’s deadline.